We are gearing up for a couple of fun weekends camping, and I’ve been stocking the RV slowly in preparation. It’s a given when we go camping, we spend most of our time outside enjoying nature. Being out in nature in a great way to unwind but with nature also comes bugs. My family’s property has a stream running through it. Even though the water is moving, mosquitoes are a problem in the early evening especially when it’s humid. With mosquitoes carrying more and more illness, finding ways to keep them away has become a priority. 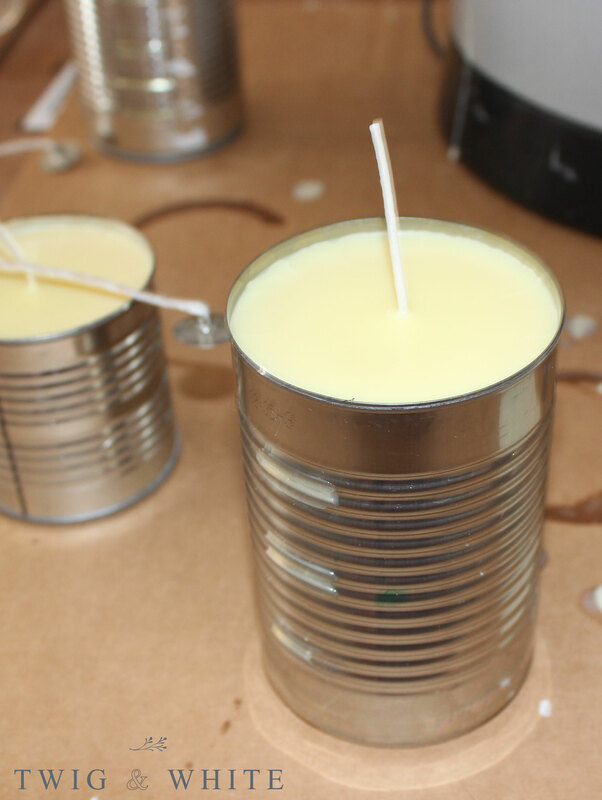 With dogs, and for our own health, I don’t like using a lot of harsh chemicals so I started looking into ways to making my own candles in a more natural way to burn around our campsite. 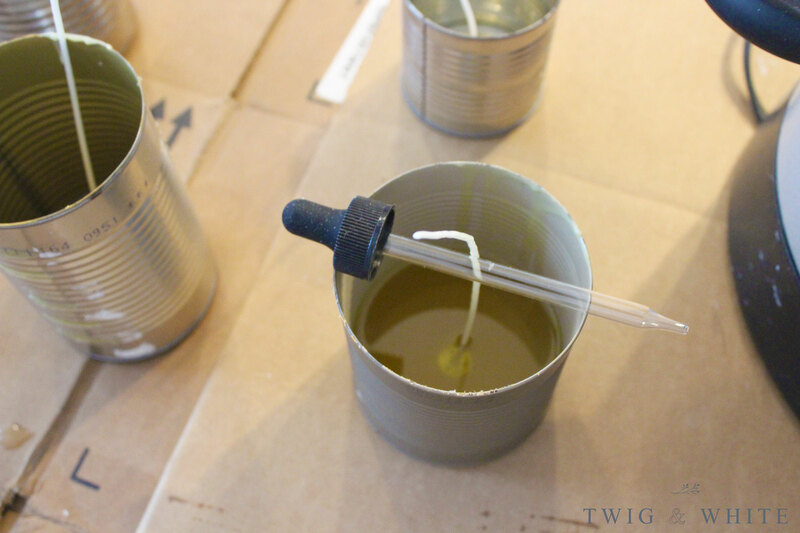 I have made candles in the shop several times and it’s actually pretty easy and I found citronella oil that can be used for candle making. I also have a few pounds of soy candle wax left over in the shop from a client project last year that I’ve been wondering what I was going to do with. 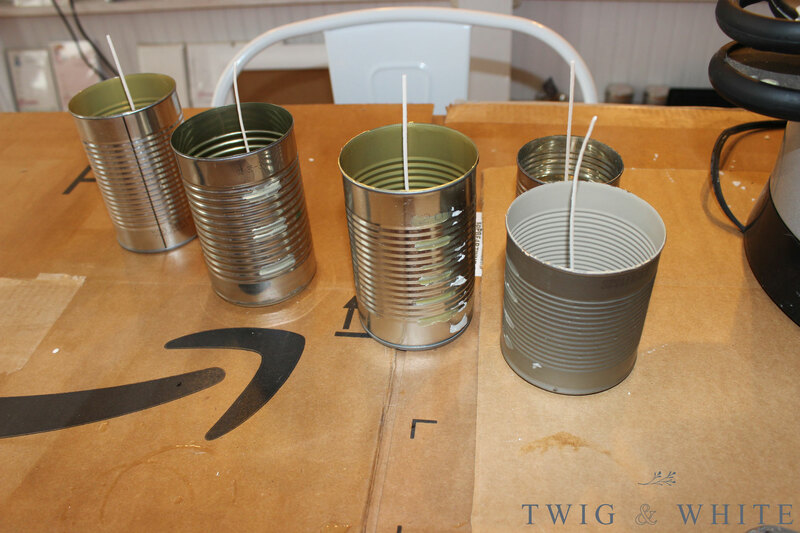 After putting some thought into an inexpensive container to make them in, I decided to try recycling empty food cans. 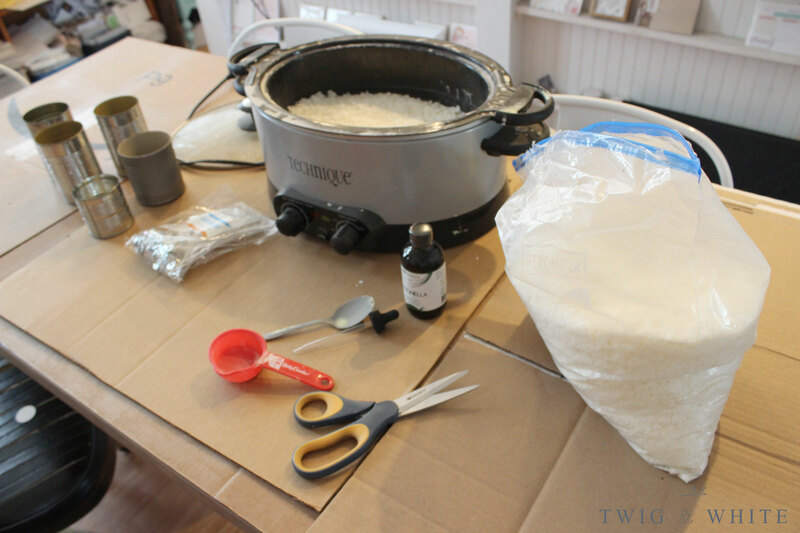 wax (melt down old candles, use wax chips for candle making, etc.) I used Soy Wax purchased from Amazon. 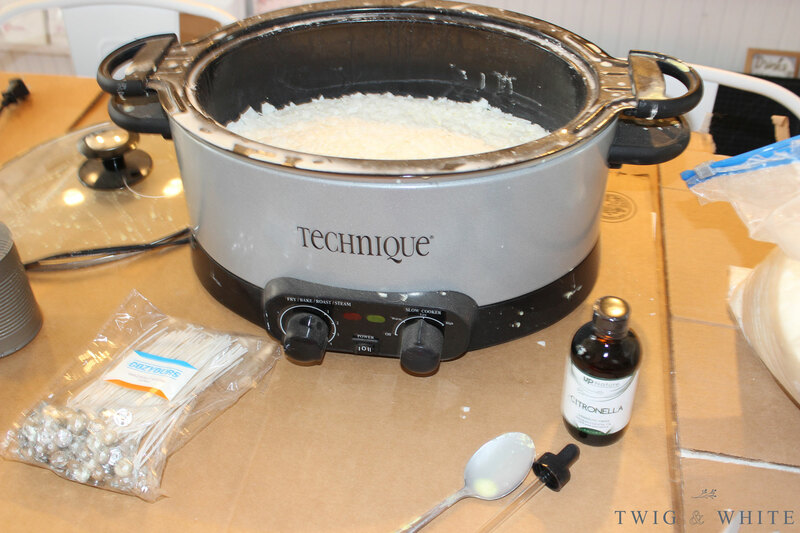 double boiler, crock pot or this fancy thing (I bought a large crockpot at a yardsale for $2 that I use strictly for candle making) Don’t use something good from your kitchen because it will be ruined. 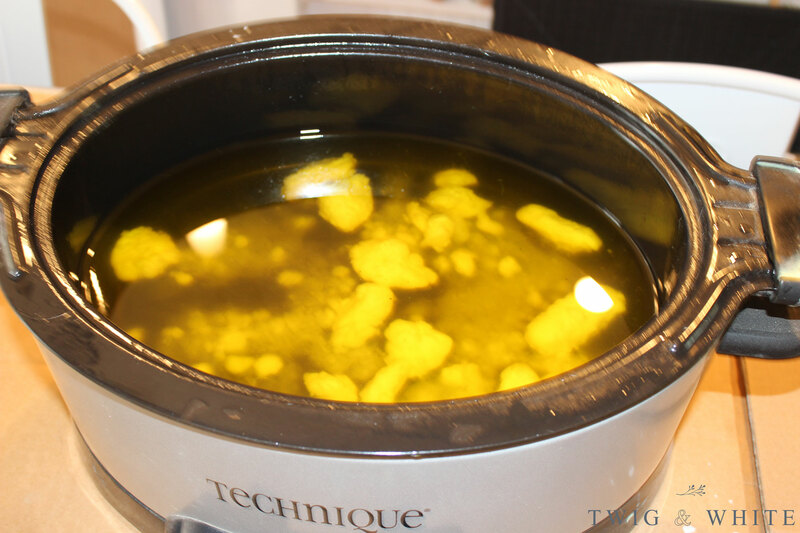 I love using the crock pot/ slow cooker because they don’t get too hot where they scorch the wax. My father-in-law has used an old stock pot over a camp stove to make fire starters with wax and saw dust, so I’m comfortable saying it really doesn’t matter how you melt your wax. My only suggestion is to not use anything good. I typically wait until the wax is completely melted before I add my oils. Read the recommendations on the bottle to know how much to use. 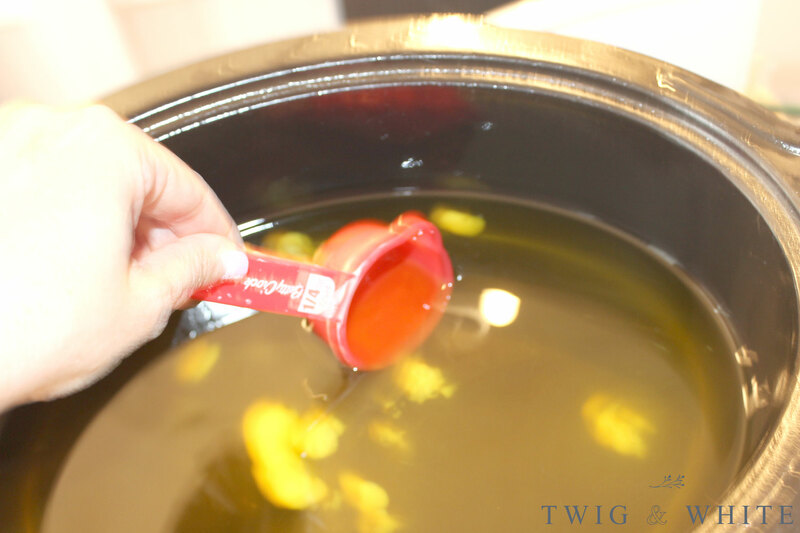 Once added, stir to combine and mix the oil into all of the wax. 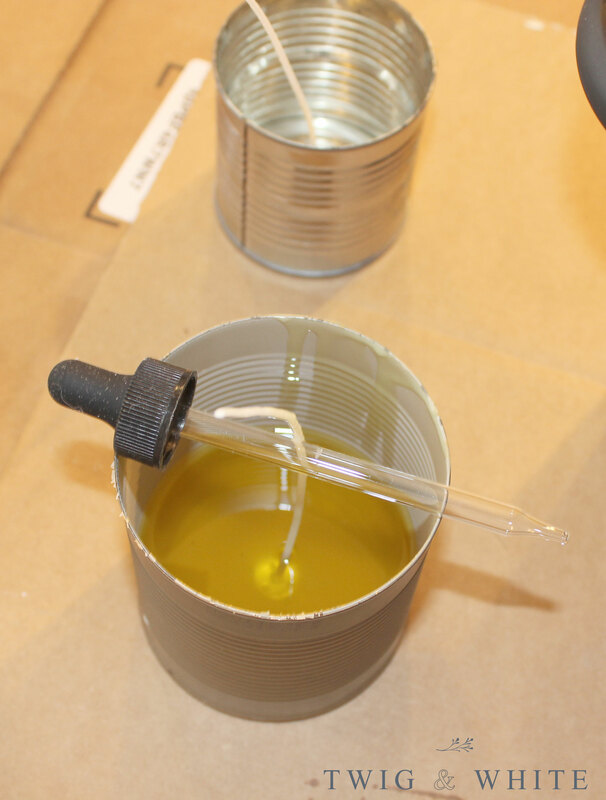 Once your wax is melted and you have added your oils, it is time to pour the wax mixture into your containers. Because I use a slow cooker, this is a messy process. 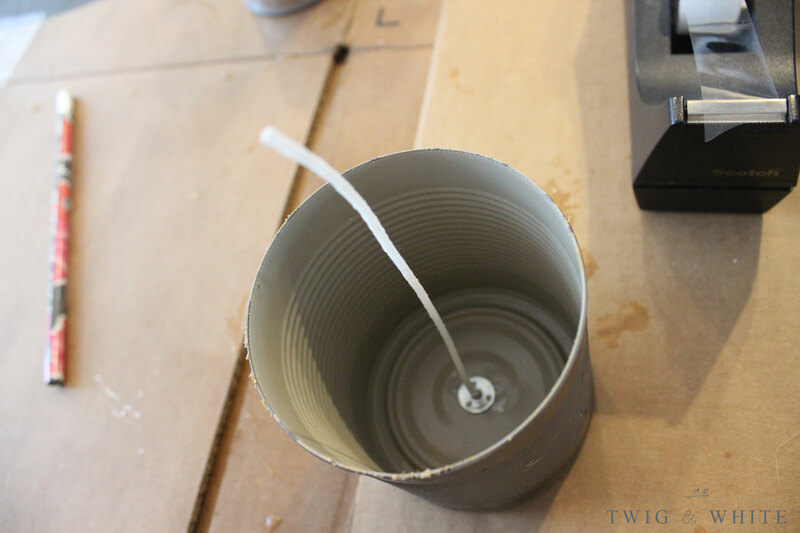 I use an old measuring cup with a spout and slowly add wax. 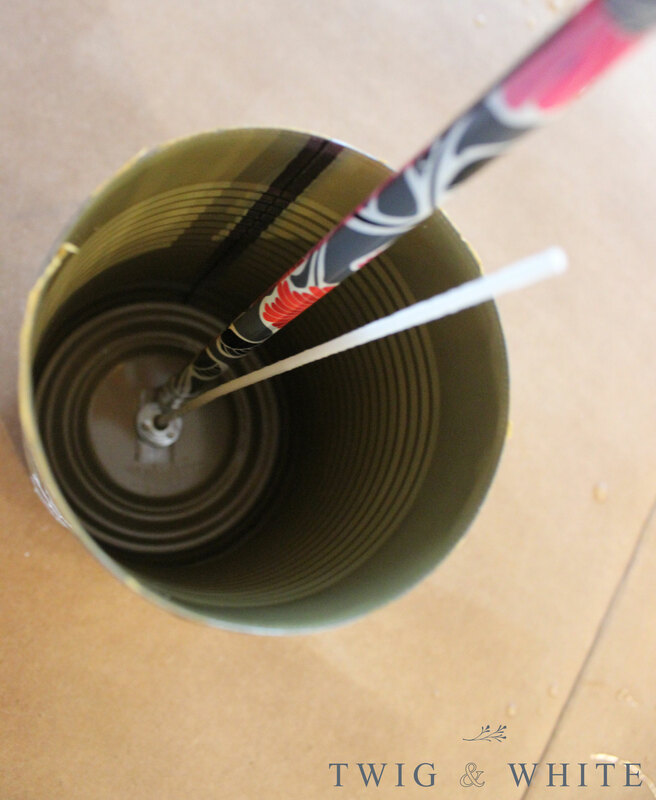 If cracking is a concern, add wax in layers. 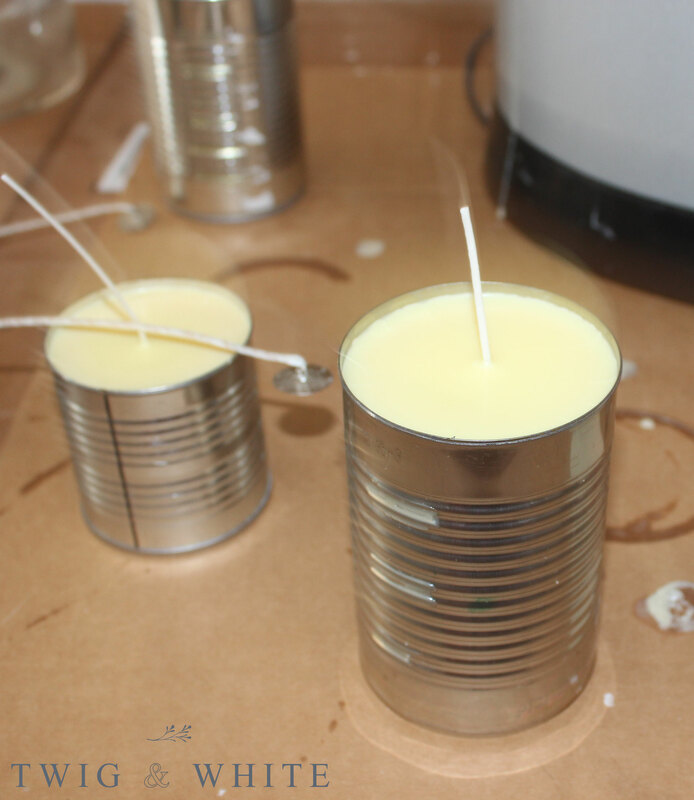 I will be using my candles for camping so I don’t care too much about imperfections. 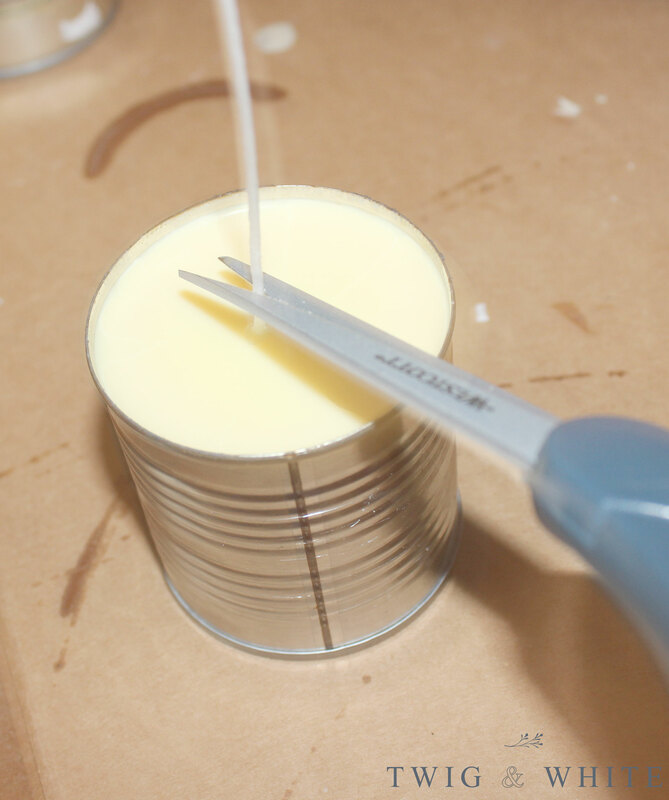 Because I am using cans, I could have added about an inch of wax at a time, waited for it to solidify and then added more until full. I have also found from making candles in the shop that if a candle does crack when cooling, carefully pouring a layer of melted wax over the top of the candle so that it fills in the crack also works well and takes just seconds to do. 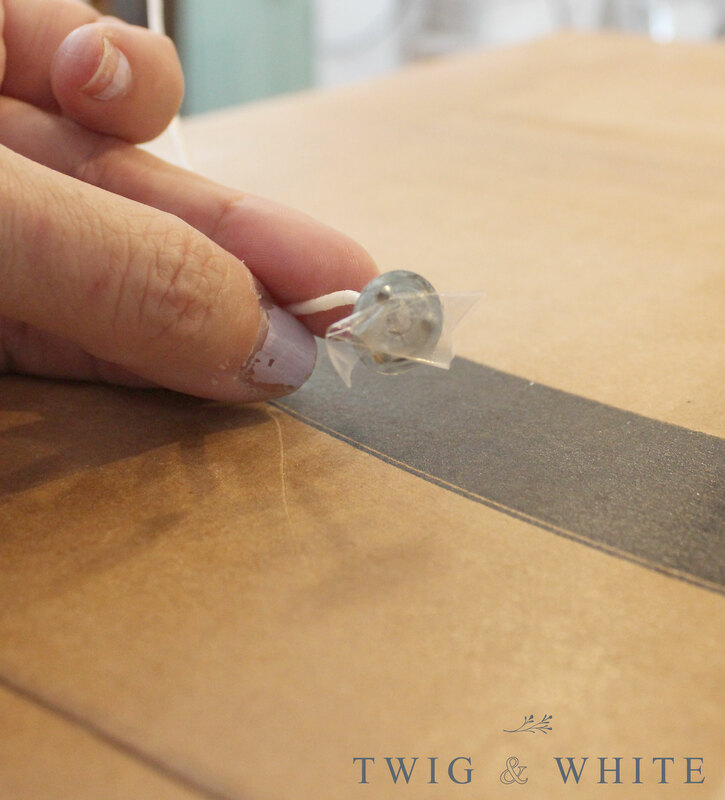 If your wicks are too tall, trim them leaving about a 1/4″ – 1/2″ exposed. 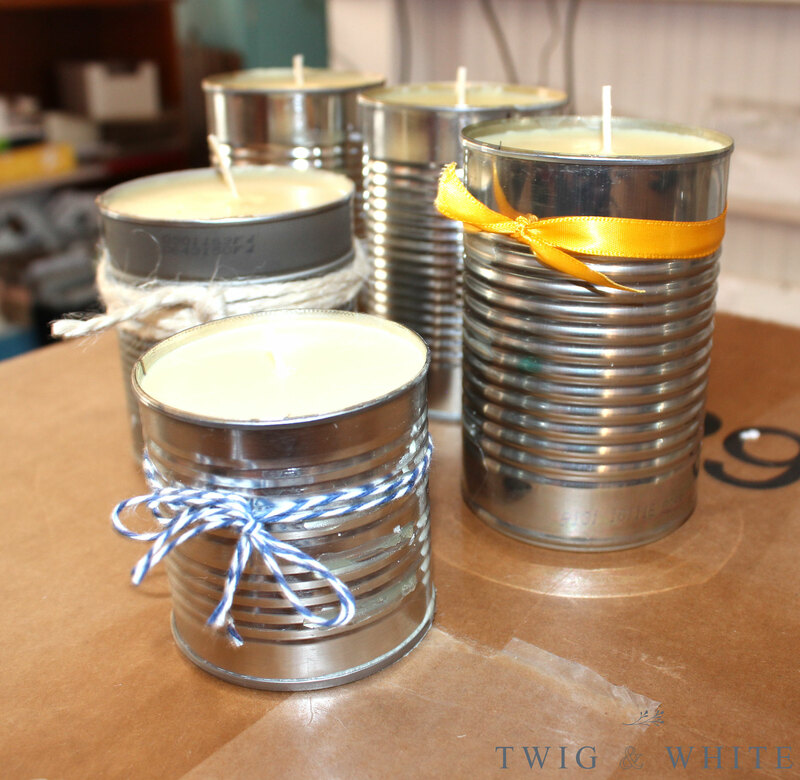 You don’t want to leave your wick too long but you don’t want to cut it too short either. Once the candles are cooled, they are ready for use. 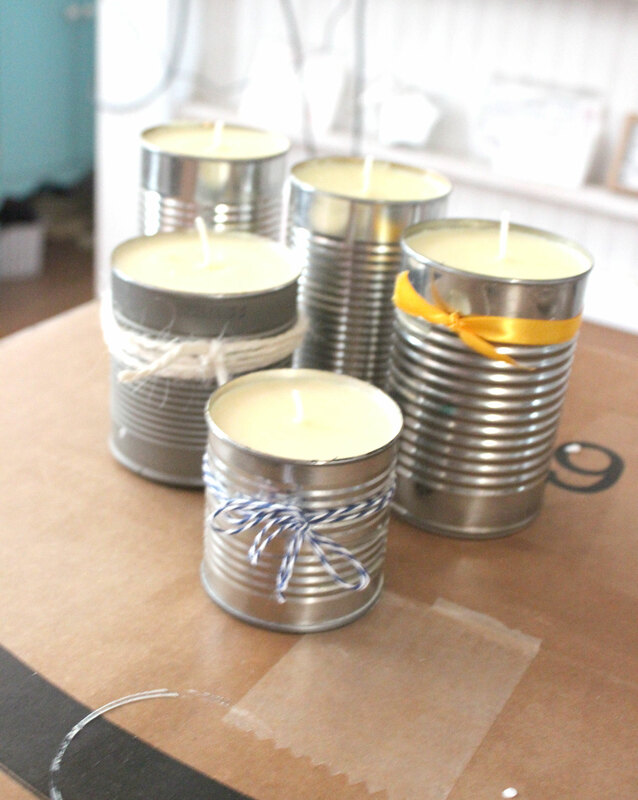 I wont be burning mine until we go camping but I did take a few minutes to dress up my candles with some ribbon and twine scraps in the shop. This was my first time making citronella candles. I can honestly say that the smell of citronella never bothered me but the smell is extremely strong when making these candles. 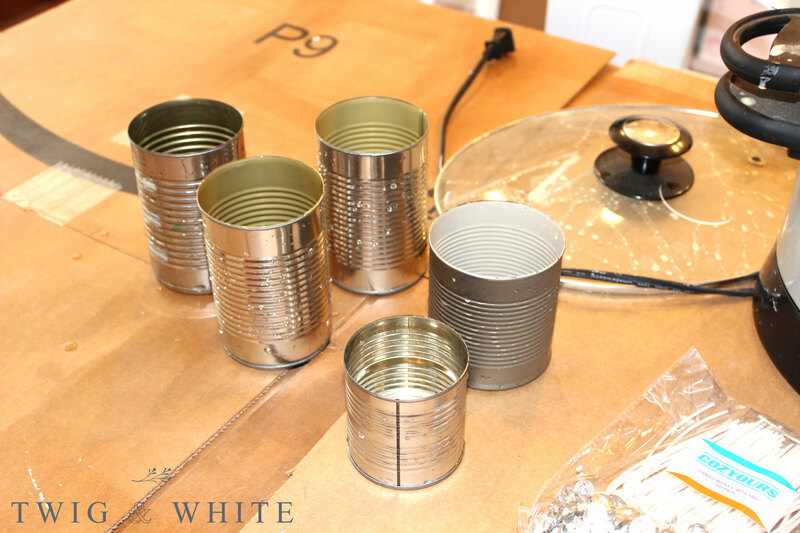 I love that the cans will be durable but they are cute and fun and a great way to reuse something I already had and save money. 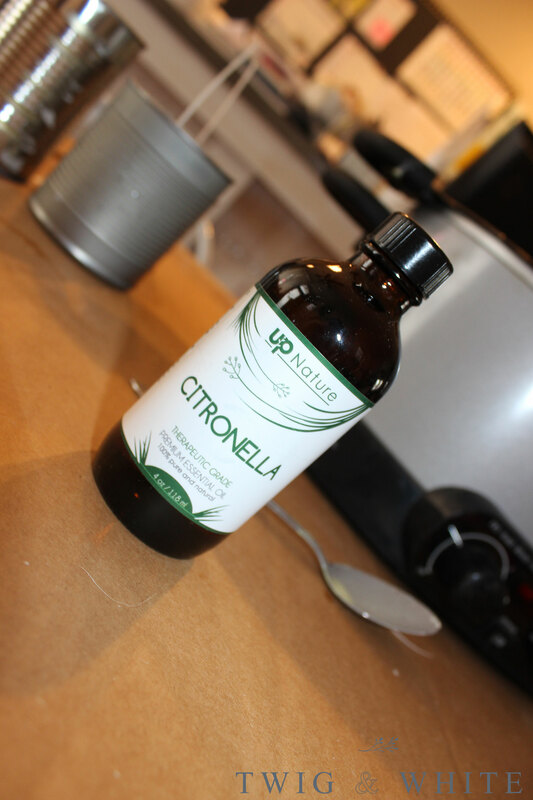 I would definitely do this again for an easy weekend project but the next time, I think I will experiment with adding in other oils to help cover the smell of the citronella. What about you? 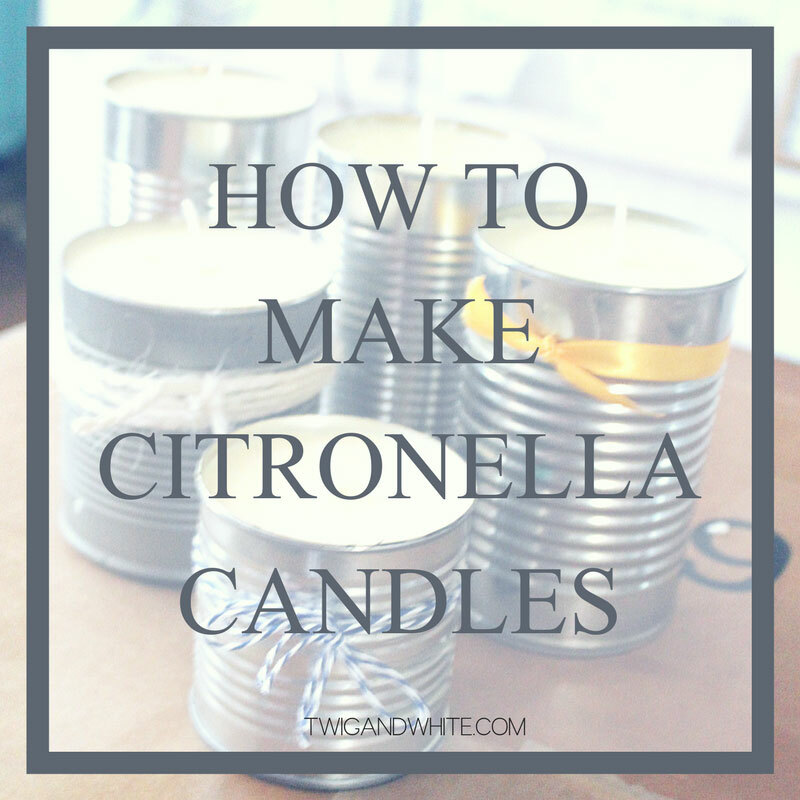 Have you ever made citronella candles? Do you add in other oils to help cover the smell? I’d love to hear about your experience.